I am always thinking about how art reflects what is going on in our world. Obviously, in the current recession, a lot of folks are not going to have extra money to spring for a painting or sculpture. And how will a depressed art market affect what artists create? During the Great Depression (1929–1941), an even worse economic downturn than the current one, American art reflected the hard times, interestingly enough, by turning its back on European modernism, and focusing renewed interest on indigenous American culture of the “good old days.” Have your students create a work of art that reflects their impression of the mood now that we are in economic hard times. Starting in the 1920s, with the boom in American industry, many became fascinated with the folk arts and culture of the nineteenth century. This was because they believed that the nineteenth century reflected the seeds of “Yankee ingenuity” that led to the industrial boom. During the Great Depression, the interest in native folk art was grafted into the social realist style that dominated American art during the 1930s. President Roosevelt’s Works Progress Administration—a bureau that put thousands of Americans to work in public service jobs—also had a Federal Art Project component which employed thousands of artists to create uplifting works of public art (look at any post office or train station dating from that period). Part of the FAP was a massive undertaking to document American material culture from the colonial period to 1900 was the Index of American Design. The project employed one thousand artists to create illustrations of art, decorative arts, tools, fashion, and folk arts from America’s past. 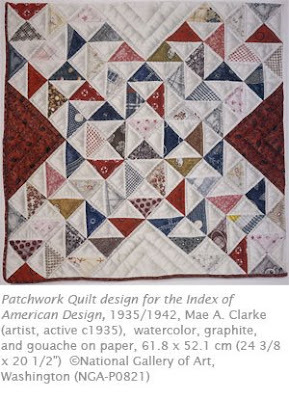 Not only did the index trace the regional diversity of American material culture, it also allowed the artists involved to create a compendium tracing an indigenous American design tradition. The resulting collection, which is now housed at the National Gallery in Washington, DC, contained 18,000 watercolors. Mae Clarke was one of the many artists who worked on the index. She specialized in depictions of objects traditionally produced at home by women. It would be an understatement to suggest that Clarke’s works help to document the significance of women’s mostly unsung contribution to the history of American art before the twentieth century. Mae Clarke’s work from the Index. Art Connections: Although many people struggle to make ends meet during a recession, it can also be a time of great creativity. Many artists are working at a grassroots level, thinking outside the box by using recycled or found materials and staging public performances. This video from the 2008 Whitney Biennial shows the great variety of works that artist are creating, despite or because of the state of the economy. The possibilities of art during such times can show us how to persevere and use available resources to make the best out of a difficult or overwhelming situation. Thanks so much for this blog. I just found you via Deep Space Sparkle. I've just begun classes with teens, so I will be visiting here often for deeper inspiration!